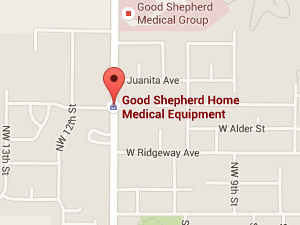 Good Shepherd's Home Medical Equipment store front is your source for a complete line of home medical supplies and equipment. Visit the new Home Medical Equipment website by clicking here. Store front hours are 8:00 am to 6:00 pm, Monday through Friday excluding major holidays. On-call emergency service is available during off business hours on a 24/7 basis. GSHCS Home Medical Equipment accepts Medicare, Medicaid, and most major commercial payers.